We’ve come to the last week of GMAS testing! The test will take place Monday, Tuesday, Wednesday, and Thursday. Please see the classroom calendar link to know who is testing each day. Because of the schedule, you will not have word study or vocabulary lists. Lessons will take place after testing each day, and will focus on our novel studies, geometry concepts, and sentence analysis. On Tuesday, April 30th at 5:30 pm, Ellis Montessori will hold its annual science night! This celebration of all things scientific is a chance for students to show off their science works and research. Please let your teacher know if you would like to participate by submitting a science project, collection, or experiment. After a full week of testing, it’s time for the 5th graders to have some worktime while the 4th and 6th graders take the ELA GMAS. The test will take place Monday, Tuesday, and Wednesday. There will be no testing for anyone Thursday, and there is no school Friday. Because of the schedule, you will not have word study or vocabulary lists. Lessons will take place after testing each day, and will focus on our novel studies. Parent/teacher conferences are taking place this week. I'm so excited to speak to everyone about what's been happening here at Ellis during term 3. A practice GMAS test will take place on Wednesday and Thursday. It will give you an indication of what to expect the actual test to look like. It's time for term 3 conferences! Mr. Trent's homeroom families are welcome to sign-up by clicking HERE. I look forward to meeting with you once again! 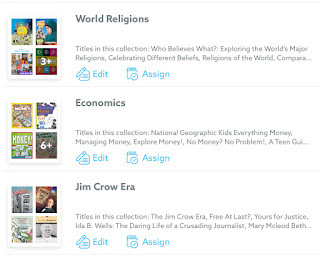 I’ve updated your Epic accounts with some great collections of books based upon our current lessons in Social Studies. It’s a great place to look for information about the topics we are discussing and for help with your followup and choice works.